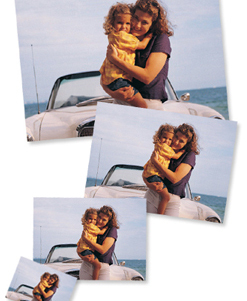 We can enlarge photos and print them on various types of paper/substrates. They can be printed on photo paper, bond paper, watercolor paper, canvas, foamcore, gatorboard, etc. Photo enlargements make wonderful, personalized gifts. Using our flatbed printer we can even print photos on wooden doors, wooden cabinet doors, ceramic tiles, etc! Ideally, photos should be enlarged from a high resolution digital file, however, if you only have a hard copy photo available we can work with that as well!